EximiousSoft Banner Maker (Pro) is a great application for ceating GIF banner ads. web buttons and headers etc. web graphics. It has all essential vector-based drawing tools and supports layer editing. Banner Maker (Pro) comes with 200+ web button templeates and 5000+ preseted symbols and may pre-designed gradient style. 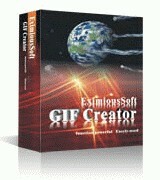 It also provides 60+ visual effects to build impressive animations or GIF banners by one click. Each drawing shape object can be made with drop shadow, glow, reflection, 3D bevel etc. visual effects. The main function of Banner Maker (Pro) is to help users create professional visual banner ads, web button, etc. It not only can design impressive static pictures, but also produce eye-catching gif animation. Normally, there is one frame image of several frame images in GIF animation. What’s more, each frame is one individual picture. Every time, when creating gif animation, probably you already know what frame images it includes. It’s easy for you to edit or manage frames. Click "Create a blank frame" tool button on Frames list bar, you can create a completely new frame, no any image object at all. Click "Add Frames from images files" tool button on Frames List Bar, it allow you to load many frames into animation from external image files. Click "Delete Selected Frames" tool button on Frames List Bar, delete the frames you don’t want. If you want to make similar frame pictures in an animation, first you can select existed frames, then click "Duplicate the selected frames" tool button. Some new copied frames is created and then made change in part of them if needed. There are many other tool button on Frames List Bar. Which can be used to adjust the consequence of selected frames in animation. Banner Maker supports to set up delay time for each single frame. There are many high quality banner modes, background pictures, web button, vector shapes and logo which embedded in Banner Maker (Pro). When creating new banner or web button, you can take advantages of these resources and material, it can save time for you. Open "Shapes" view in the left of program, select suitable category, find vector a shape you want, click or drag it into your banner design. Open "Cliparts" view, select suitable category, finds a logo symbol you want, click or drag it into your design. Banner Maker (Pro) is also a powerful vector design tool. In vision of Banner Maker (Pro), each vector shape is consisted of many closed path. Each path is consisted of many continual straight lines or curved lines. Banner maker (Pro) not only offer many available vector shape, but also can customize personal vector graphics. Select "Customs Shape" tool button in "Home" category, then click to draw continuous straight lines, drag to draw continuous curved lines. Repeatedly doing previous operations, till finish premium outlook design, double click or click right key to finish this step. Select "Move Anchor" tool button, move the selected node which in its own path to other locations where you expect. Select "Add Anchor" tool button, add a new node to the selected path. Select "Delete Anchor" tool button, delete selected node in its own path. Select "Convert Anchor" tool button, convert curved lines to straight lines, or vice visa. Besides function mentioned above, Banner Maker (Pro) also offer you many vector shape making tools which can help you to make impressive banner ads. Normally, there are different vector shapes, pictures, text objects in one banner. Banner Maker (Pro) have many ways to organize or manage these objects to make each objects as unique show in ads. To move, scales or rotate shape or text objects by visual click or drag. Select a tool button in "Fill inside" sub category, enable your selected shapes and texts are filled with solid color, gradient colors, images and textures. Select a tool button in "Stroke Outline" sub category, enable your selected shapes and texts are stroked with solid color, gradient colors, images and textures. Select a tool button in "Effects" sub category, enable your selected shapes and texts are rendered with drop shadow, reflection, glow, 3D bevel effects. Select "Group" in "Home" category, group the selected shapes, texts and group object together so that they can be treated as a single object. Select "Move Forward" tool button or "Move Backward" tool button in "home" category, to control your selcted objects are shown in front of or in back of other objects. Banner maker (Pro) also offer you many powerful function to help you make animation quickly, or optimize animation & preview animation. Try to find "effects" menu in "home" category, then select a effect sub menu item, you can see specified process during converting into amazing animation. In each transferring effect, there are some options, you can select specified option to get animations as you want. "Resize Banner" can help you to scale all objects in the banner, while resize canvas only can adjust the dimension of canvas. Select "Optimize" view, you can optimize all frame images in animation to get GIF file with minimal size, but no loss in picture quality. Select "Preview" view, you can preview the banner animation in Web browser directly. This product is excellent!!. It is Very easy to understand and use. Easily create and edit professional-looking logos or other business graphics. Create animated GIF or static pictures, Edit and Optimize GIF Images. 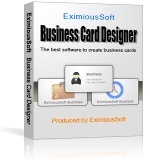 Create and design good-looking business cards and print them freely.